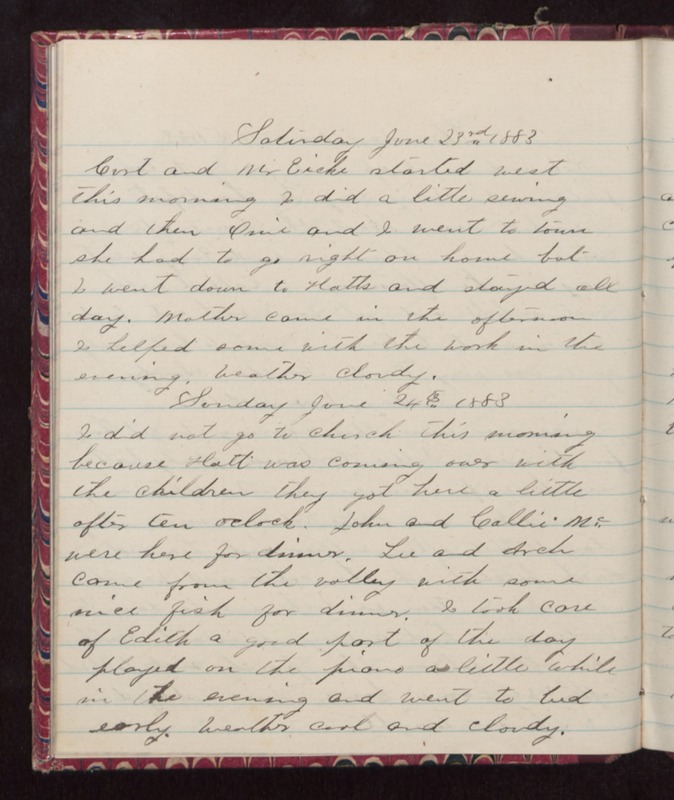 Saturday June 23rd 1883 Curt and Mr Eicke started west this morning I did a little sewing and then Onie and I went to town she had to go right on home but I went down to Hatts and stayed all day. Mother came in the afternoon I helped some with the work in the evening. Weather cloudy. Sunday June 24th 1883 I did not go to church this morning because Hatt was coming over with the children they got here a little after ten oclock. John and Callie Mc were here for dinner. Lee and Arch came from the valley with some nice fish for dinner. I took care of Edith a good part of the day played on the piano a little while in the evening and went to bed early. Weather cool and cloudy.